The early days of LED technology saw it mainly used only for advanced scientific applications and by garage-engineer hobbyists. When I was growing up in the 70s, my friend’s dad was an engineer for Motorola, so my nerdy friends and I had access to drawers full of them. Most people saw them as toys back then. Back then, most of the light bulbs in any given house had GE or Philips logos on them. Fast forward to 2017, and LED technology has fairly recently advanced to the point where it can replace traditional lighting. There’s been an explosion of new LED companies, and LOFTEK is one of those companies. I had never heard of them before they sent me an outdoor multi-colored LED flood light, which still sits outside my brother’s brewery, usually showing green if the bar is open, and red if it’s not. LOFTEK supplied me with these two lights as well, the SANSI 15W warm white and the 30W cool white. Modern LED light bulbs should be considered as basically just disposable flashlights, since there’s nothing user-serviceable inside. They mostly use the same type of LED emitters that were perfected by flashlights, and similar circuitry as well. So it’s all the same components of a flashlight. Super Bright – 3000lm, E26 holder, 30W LED Bulb equivalents to 250W incandescent bulb. These gorgeous LED bulbs provide bright lighting for your dark garage, making the night as bright as day. Energy Efficient – These 30-watt LED lights can help you save hundreds over the lifetime of the bulb. Comparing to traditional light bulb, under the same brightness you could save nearly 240 Kilowatts in one year with 3 hours of use each night. 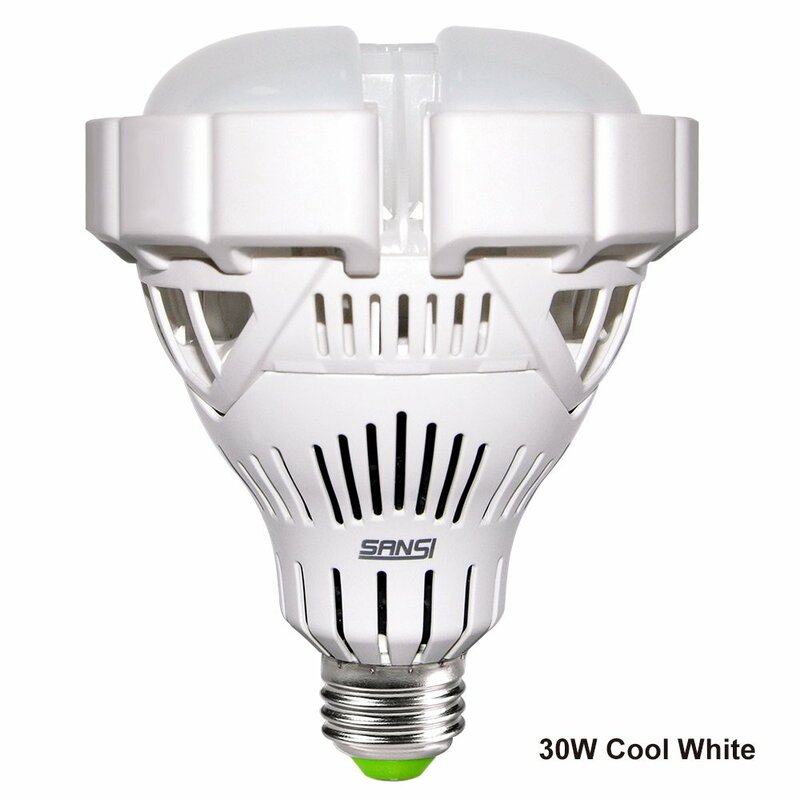 Good Quality – SANSI LED Bulb adopts patented technology—the ceramic heat dissipation technology, by which lighting security and cooling efficiency are greatly improved. Wide Applications –Great for garage, warehouse, barn, garden, office, shopping mall, supermarket, station, restaurant, hotel, workshop etc., indoor anywhere need bright light. What You Get – SANSI 6500K LED Bulb, our fan-favorite 5 years warranty and friendly customer service. Save up to 88% ($200) in energy savings compared to a 150W equivalent light bulb. Compare our light! At 133 lumens per watt, we have the highest rated lumen/watt ratio versus all other LED light bulbs using our ceramic technology. Ceramic dissipates heat more efficiently versus older aluminum LED technology. 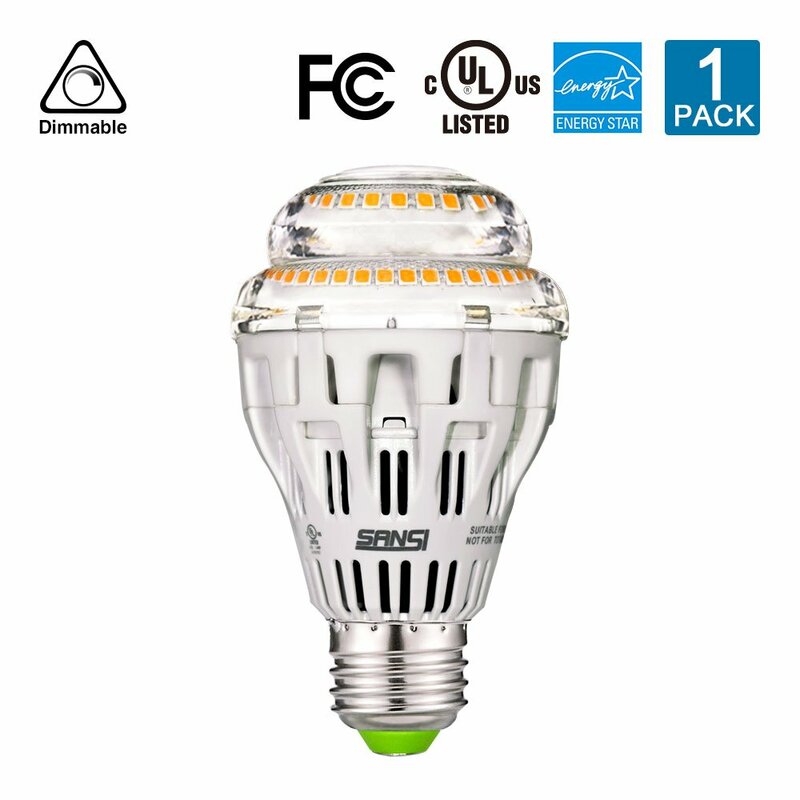 Energy Star Certified, UL Listed, Dimmable, No Flicker, Standard E26 Base, Traditional A19 sized bulb. Ceramic vs. Aluminum: Our LED chips are mounted directly to the ceramic making each chip PC board and adhesive free. Aluminum requires a bigger bulb base than the A19 and produces less lumens per watt. 30,000 Hours Lifetime, Omni-Directional 270° Beam Angle. The 30W (cool white) bulb came with a built-in diffuser, just as I would expect. At that output level it could blind you in any clinical definition if you stare directly into the LED. The downside to a hermetically sealed diffuser is that I can’t see the way the individual LED emitters are mounted to get a feel of its quality. But it looks pretty solid, and it’s heavy like the 15W version. The 15W (warm white) bulb really interested me, because it’s something I plan on using every day, which is the best way I can test it. This is their warm white version that I specifically asked for. LED lights don’t have to look like the sickly blue of decades of fluorescent lighting. The warm versions of the emitters cost a little more to produce, so most companies are pushing the cool white versions of their products, which is a shame. Taking it out of the box, it seems much heavier than I would normally expect in a light bulb. And that’s actually a good sign, because LEDs put off heat, and the best way to keep something from getting too hot is to have lots of some type of insulating material. These use ceramic for their insulation. As I said above, before the last review, I had never heard of this company. The product they linked me looked cool but a little cheap in the photos, so we were all surprised to see how solid it was, and how well it’s held up to being outside for months. It rains a LOT here in Portland, Oregon, and it’s held up even to a little snow. So, I wasn’t that surprised that both these bulbs give me a good initial impression. Holding them in my hands, looking at the construction, plugging them in, and turning them on: Just what I would expect from a decent quality light bulb, and it seems like it’s just a little better constructed than a Philips warm white LED bulb. I had two, but one crapped out after about a year’s worth of use, so I’m always happy to run competing products side by side. Good, overall. The LEDs on the 15W bulb look to be well mounted and of generic Chinese manufacture. These types of generic emitters aren’t as good as Cree, but at a fraction of the price, they can be good values if you get decent ones. These days that’s kind of roll of the dice. Flashlights that put out a similar amount of light as these bulbs tend to be on the heavy side, just like these two bulbs. More weight means more ceramic in this case, which means more “thermal mass,” which means more effective cooling. But excess heat is a bigger problem than with bulbs made from fewer emitters, so anything with this many emitters is going to need to be on the heavy side if it’s decent quality. I would have liked to see a diffuser on this model, but it’s not a huge issue because of the way it’s mounted now, and also because I can see the way the emitters are mounted. It’s overly heavy just like its cousins, as it should be for a 200+ watt equivalent bulb. I like that it has a plastic ring so you can unscrew the bulb when it’s hot. Nice touch. It seems solid just like its 15W cousin. I’ve tested both of these bulbs extensively and I like them. The 15W warm white bulb has a good tint (3000K), and it’s probably turned on 8-12 hours a day. It’s a tad heavy for the clip on lamp I have it in, so I had to re-position the clip a little, and it’s been fine ever since. These seem like good products, but for a light bulb it’s hard to know the quality without having them turned on for long periods of time, which I’ve tried to do for this review. The LED floodlight they sent me has been powered on outside my brother’s bar for about 6 months, so I feel pretty comfortable recommending their products.